With very little fanfare, the artist Marisa Osorio-Farinha has parlayed her refined creativity – seen to best effect during her 15-year embroidery collaboration with Hermès – into the hotel business. The four-bedroom House of Birds, the first salvo of her Alentejo Villas by Siècle brand, hides behind a relatively inconspicuous white ochre and granite house in the old Portuguese town of Crato, the 13th- and 15th-century HQ of the Order of Hospitaliers and the Order of Malta. 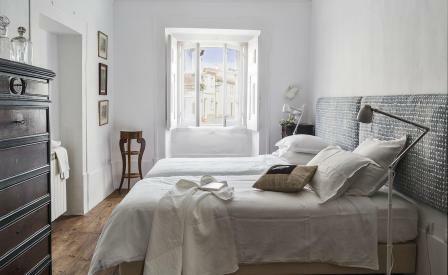 Following a two-year overhaul, the rambling interiors now feature a charming mix of artfully restored, four panel ceilinged rooms swathed in hues of blue and white, ecru and creamy pastels, and walls that are decorated with Osorio-Farinha’s hand-painted murals and whimsical aviary decoupage, and headboards sheathed in hand-printed linen. A spacious kitchen lined in ochre and marble makes for a conducive stay-in dinner party, whilst a bijou outdoor pool flanked by high white walled terraces sets the scene for summer lie-ins. Sensibly, Osorio-Farinha takes full advantage of the area’s cultural and extracurricular offerings, her curated menu of day-trips including a spot of falconry, picking on petiscos (the local version of tapas), and a tour of Crato’s impeccably aged Roman ruins, monasteries, convents and megaliths.